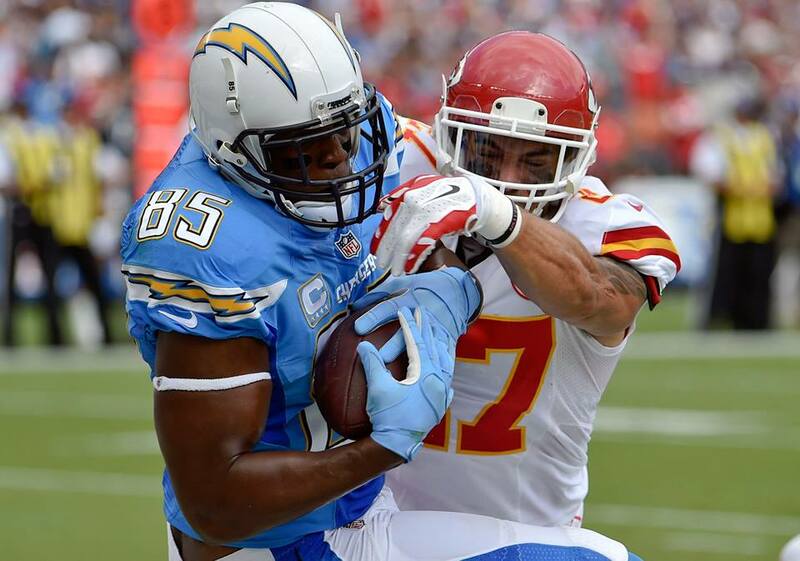 Antonio Gates catches a pass over Kansas City defensive back Kurt Coleman. Gates finished the game with three catches for 61 yards and a touchdown. Photo courtesy of San Diego Chargers Facebook. The San Diego Chargers five-game winning streak was snapped on Sunday courtesy of the Kansas City Chiefs, who defeated the Bolts 23-20, in front of 65,260 fans at Qualcomm Stadium. Rookie kicker Cairo Santos—who had made six out of eight attempts entering the game—delivered the game-winning 48-yard field goal with just 21 seconds left. The 48-yard make was the longest of the season for Santos, and the longest of his career. Helix High graduate, Alex Smith, took control of the game by keeping the Chargers offense off the field. Kansas City had the ball for 39 minutes compared to just 21 minutes for the Chargers. Crucial penalties played a key role in the time of possession battle, the Chargers committed seven penalties for 73 yards as a team. They now have the second-most defensive penalties in the NFL with 57. Several of the penalties occurred due to injuries on the defensive front that forced players like linebacker Reggie Walker and cornerback Richard Marshall into extended duty. Walker, was dinged for a roughing the passer call on a third down in the second quarter that led to a K.C. field goal, and Marshall—got called for holding on a third down deep in Charger territory, which would end up leading to a Chiefs touchdown. Philip Rivers had a chance to tie the game with 21 seconds left and two timeouts following the Santos field goal, but he was picked off on his second pass attempt of the drive, his third interception of the season. Rivers would finish the game with a season-low 205 yards, and a season-low completion percentage of 54.8. Rivers hit seven different receivers throughout the game though, including tight end John Philips who caught his first pass and touchdown of the season ,all at once, to give the Bolts a 7-0 lead in the first quarter. However, Rivers struggled with converting on third down, going 3-10. Smith on the other hand flourished on third down’s going 7-14, and finished the day 19-28 with 221 yards passing and a touchdown. A lot of the third down conversion success can be credited to running back Jamaal Charles who ran for a season-high 95 yards on 22 carries and added a touchdown as well. Charles lone touchdown of the game came in the second quarter on a 16-yard run which tied the game 7-7. On the play, Charles collided with Brandon Flowers in the end-zone, which subsequently kept Flowers out of the rest of the game with a concussion. Antonio Gates would give the Chargers a 14-10 lead going into halftime thanks to a 27-yard pass from Rivers, making it the third straight week Gates has caught a touchdown. Kansas City then got the ball after half and scored twice in a row, once on a Santos 40-yard field goal, and again on an 11-yard reception from fullback Anthony Sherman, which brought the score to 20-14 midway through the fourth quarter. Third down conversions continued to haunt the Chargers in the fourth quarter, as they were forced to settle for two straight Nick Novak field goals which tied the score at 20. Santos would then go on to deliver the game-winner which put the game on ice for Kansas City. The Chargers (5-2, 1-1) will now head to Denver on a short week to play Peyton Manning, and the Broncos(5-1, 1-0), on Thursday Night Football.